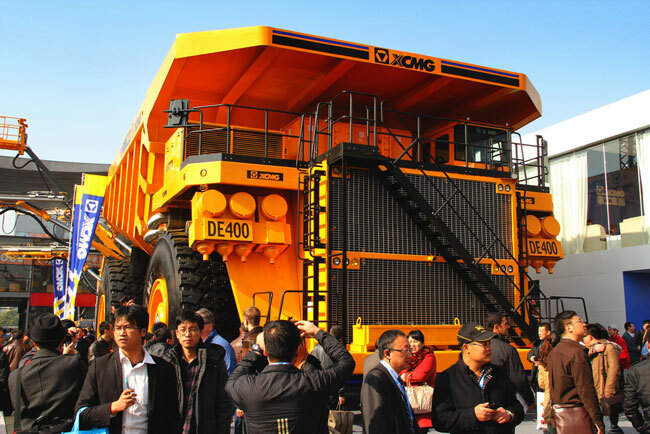 THE XCMG DE400 – The world’s largest-tonnage mining dump truck, DE400 jointly designed and developed by XCMG. www.chinaspv.com: XCMG DE400, the electric drive dumper with the largest tonnage staged on the Bauma 2012 recently. The carrying capacity of the vehicle reaches 400 ton and the highest running speed reaches 50Km/h with the lift time of 24s. The vehicle can be used in the transportation for mine, metal, steel and all the open-air mineral products to help increase the productivity of open-air mining activity and reduce the average cost. Advanced alternating current drive system and electrical control diesel engine were adopted in the vehicle. The section structure frame was made of high strength alloy steel plate. Intelligent braking technology reduced the misoperation effectively. The successful launch of DE400 symbolized XCMG officially entering the mining machinery industry, which has made breakthroughs in several key technological sectors. The product will become new economic growth for XCMG.